Gandhiji stayed from 1936 to 1948 at Sevagram Ashram and carried out all his activities from this ashram during that period. 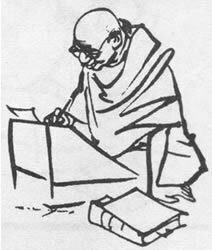 When Gandhi started his padayatra (foot march) in 1930 from Sabarmati Ashram to Dandi for the Salt Satyagraha, he had decided not to return to Sabarmati till independence for India was attained. Independence was not attained at that time and Gandhi was imprisoned for more than two years. On his release he spent sometime travelling. He decided to make a village in Central India his head quarters. He came to Wardha in 1934, at the invitation of Jamnalalji Bajaj. In April 1936, Gandhiji established his residence in the village Shegaon which he renamed as Sevagram, which means 'village of service'. Gandhiji was 67 years old when he came to Sevagram. From then on, Sevagram has become an inspiring place. Many decisions on important national matters and movements were taken at Sevagram. It became the central place for a number of institutions for the nation building activities devised by Gandhiji to suit the inherent strength of this country. Shegaon is a small village 8 km from Wardha town in Maharashtra and 75 km from Nagpur. In spite of many practical difficulties, Gandhiji decided to settle here. Though he did not have any intentions of keeping anybody with him except Kasturba, pressure of work necessitated more colleagues with him till Sevagram Ashram became a full-fledged institution. There were no facilities at Sevagram, not even a post or telegraph office. The letters used to be brought from Wardha. There was another village in this region named Shegaon, made famous by the residence of Saint Gajanan Maharaj. So, Gandhiji's letters used to get misdirected. Therefore it was decided in 1940 to rename this village as SEVAGRAM or the village of service. Adi Nivas (the first hut) and Prayer Ground: Adi Nivas was the first hut built in the Ashram, hence the name. Gandhiji lived in it with other Ashram members in the early days. The northern verandah was used as dining hall. Below the open sky on this sand-bed, morning and evening prayers of various religions were held and that has continued even today. Ba Kuti (Kasturba's Hut): This was the place of residence for Kasturba Gandhi. Bapu Kuti (Gandhi's Hut): This, as the name suggests was the place of residence of Gandhiji. His belongings of daily use are kept here. His massage table and sleeping cot are kept in the adjoining room. The daily morning prayers are held in the verandah of Bapu Kuti even today. Gandhiji's Secretariat: Gandhiji kept in touch with the whole world through correspondence from this room. The telephone, which was brought here by the British authorities for consultations with Gandhiji and a cage and wooden scissors used to trap snakes and later leave them in the forest) are displayed here. Akhiri Nivas (The last abode): Initially used as a hospital for the villagers, Gandhiji lived here to cure his cough and cold before leaving for Noakhali, from there he never returned and thus the hut got its name, Akhiri Nivas. A weighing machine used by Gandhiji is displayed here. Bapu's Kitchen: This kitchen used by Gandhiji is still used as such. A flour grinding machine, sometimes used by Gandhiji is kept here. Adya Adi Nivas: This is the place where Gandhiji first rested after coming from Wardha. Parchure Kuti: A Sanskrit scholar and a constructive worker, Shri Parchure was served by Gandhiji in this hut when he was afflicted with leprosy. Mahadev Kuti: Gandhiji's secretary, Mahadev Desai lived with his family in this hut near Bapu Kuti. Kishore Nivas: The residence of Kishorilal Manshruwala, a close disciple of Gandhiji and the part time editor of the Harijan weekly. As Manshruwala was suffering from asthma, Gandhiji allowed this house to be built with bricks and cement. Rustam Bhavan: The four room guest house, built by the son of late Rustamji for Ashram guests and still used as such. Gandhiji Exhibition: The newly developed (1991) Gandhi Photo Exhibition, exhibiting the life and works of Gandhiji, is on the western side of the road. Yatri Nivas (Visitor's Residence):Built by the government in 1982, it is managed by the Ashram for the benefit of visitors and for holding training camps and conferences by various constructive work institutions. Nai Talim Parisar (Basic Education Premises): It was guided by Gandhiji and constructed by late Ashadevi and Aryanayakamji.